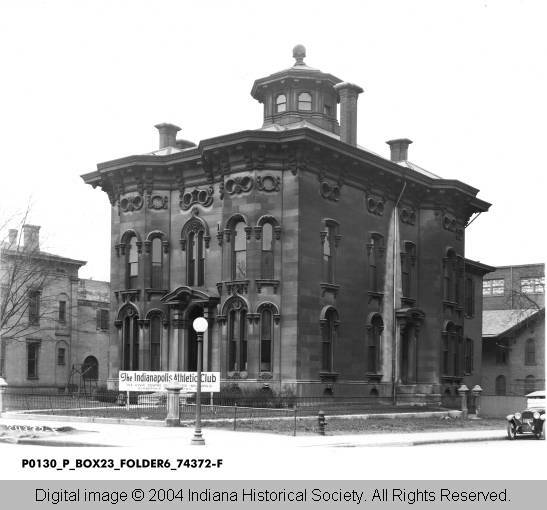 In the early 1890s the old Indianapolis High School (later known as Shortridge High School) was overcrowded and had spilled over into a temporary High School #2. School board members knew there was a need for a high school on the south side and gave their blessing for a new type of curriculum known as the Manual Training Movement that taught practical hand skills along with the traditional classes. And so on February 18, 1895, 526 students and their teachers marched from the temporary high school to their brand new building in a parade led by new principal Charles E. Emmerich. 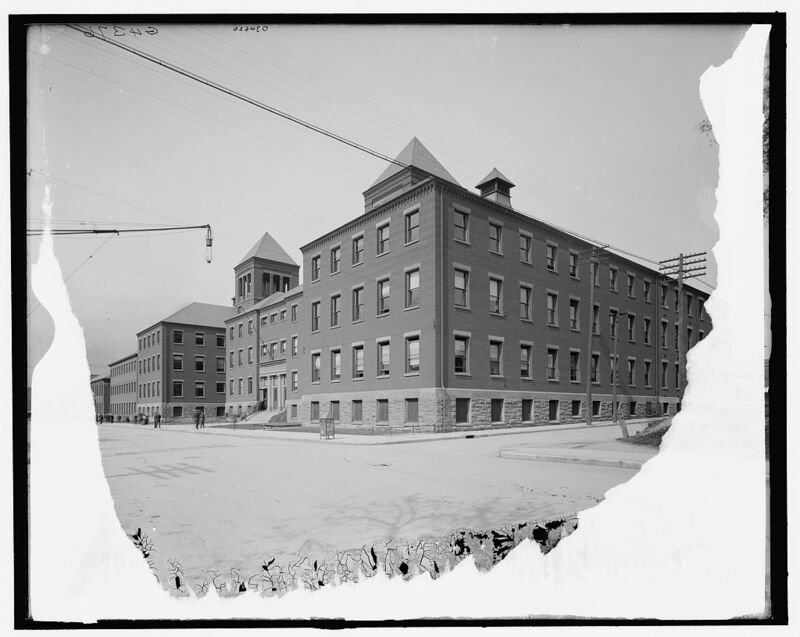 The new high school, originally called the Industrial Training School, opened in 1895 on the triangle of land between Madison Avenue and Meridian and Merrill Streets. The view above looks north on S. Meridian Street at the west side of the school. 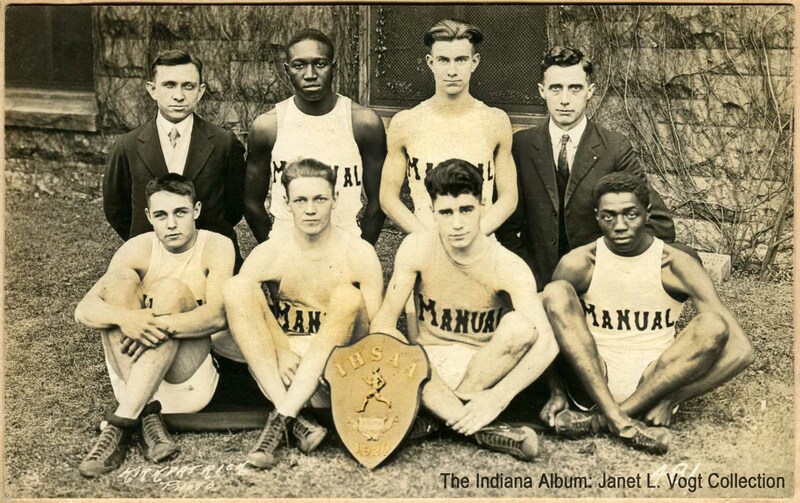 In 1899 the school officially became Manual Training High School. After fifteen years as principal, in 1910 Charles E. Emmerich retired having developed the program into one copied by many other schools throughout the country. Only a year later Emmerich died and officials changed the name to the Charles E. Emmerich Manual Training High School. 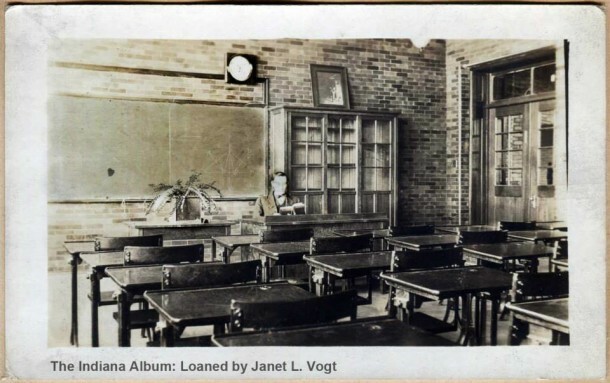 As the school thrived, in 1920 the school grew to include a south building (no longer standing) with a cafeteria, auditorium, additional classrooms, and a gymnasium. The Delavan Smith Memorial Field was dedicated in 1928. 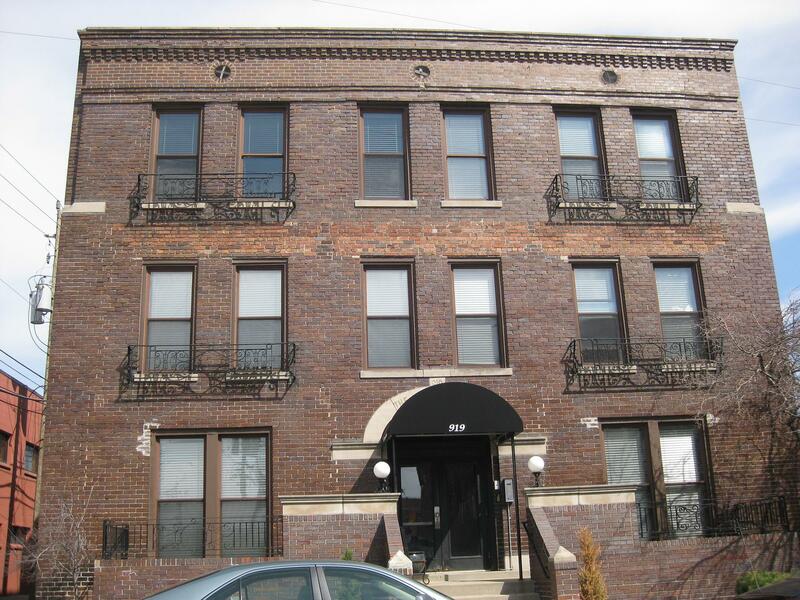 Needing a more modern space, a new Manual High School opened at 2805 Madison Avenue in 1953 at the cost of $4,500,000. The old building then housed the Harry E. Wood Vocational School until 1978. It now is occupied by businesses. Emmerich Manual Training High School students with drafting and manual training department head Winfield Scott Hiser, ca. 1920s. 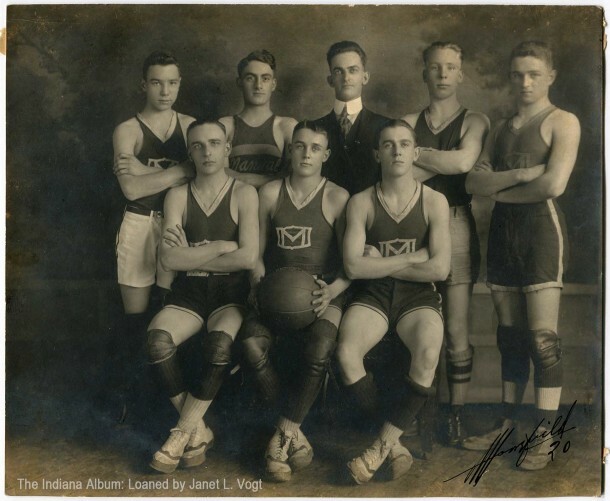 The basketball team in 1920. The lender’s father, Guy Trickey, is the coach in the back row. Trickey started teaching at Manual in 1920 and remained with the school until retiring in 1958. He was chairman of the manual training department for twenty years. 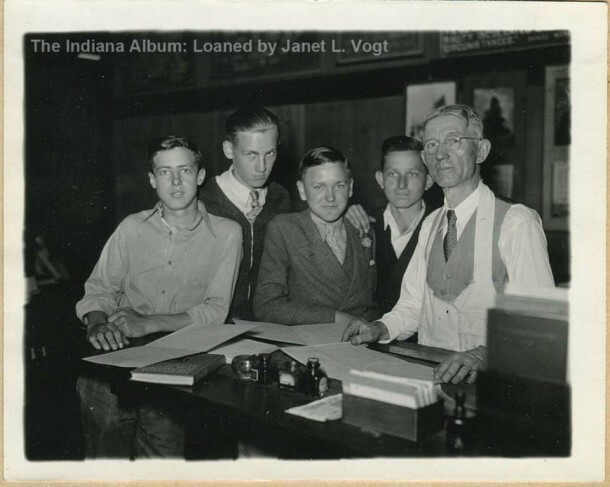 His family kept a scrapbook of his school mementos and photos and kindly lent them to the Indiana Album to be scanned and cataloged. Manual High School track Team holding an IHSAA (Indiana High School Athletic Association) plaque, 1920. Emmerich Manual Training High School students participated in a city-wide contest to design and create model houses in the 1920s and ’30s. The contest taught the boys about the building trades and encouraged home ownership. The lender’s father sometimes brought the extra model houses home and young Janet used them as doll houses. 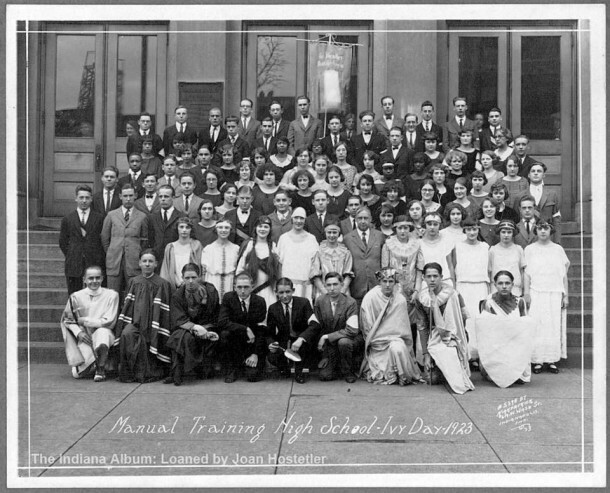 Students at Charles E. Emmerich Manual Training High School in Indianapolis taken on Ivy Day in 1923. According to a school history: “In 1909 Mr. Emmerich [principal] had started one of his traditions where a sprig of ivy was planted along the west wall of the school, and by 1952, the entire side of the old building was covered by a mixture of ivies. The school yearbook, orginially called the Senior Booster, was later changed to the Ivian in 1949 to preserve the tradition of Ivy Day.” Thousands of pages of Manual High School yearbooks dating from the 1890s through 2005 have been scanned by the Indianapolis Public Library and the IUPUI University Library and are available free online. As always, we seek other photographs of Indianapolis (and all of Indiana). Click here to learn more about our next Indiana Album Scan-a-Thon sponsored by the Beech Grove Historical Society on Monday, March 16. As I understand it, Harry E. Wood was originally a principal at Indianapolis (later Shortridge) High School…and when Shortridge retired as IPS Superintendent, he was elected Warren Township Trustee (living in Irvington) and ran the Warren Township school system, building many new schools. Harry Emsley Wood (1879-1951) was never a principal of Indianapolis High School, to my knowledge. Wood was a student at the newly built Emmerich Manual High School in the late 1890s. He began teaching art at his alma mater in 1900, which was several years after Manual was built, as well as several years after the Indianapolis High School was renamed Shortridge High School. Wood left his teaching position at Manual in 1904 to attend an art school in Philadelphia but had to drop out in 1905, because his father had fallen ill. Wood then returned to Indianapolis, and from 1905 to 1910, he taught art at both Manual and Shortridge. By 1911, he was appointed Director of Manual and Vocational Training for all of IPS. He held various positions and had various titles over the years that he was with IPS, but as far as I know, principal of Shortridge was not one of them. When Emmerich Manual High School moved to its present location in 1953, and its former building was repurposed for vocational education, Harry E. Wood was the obvious choice for the school’s name. It honored a well-respected man who had recently passed away, who had been an alumnus of the original school in that building, who had done much to further vocational education in all of the IPS schools, and who was a well-respected artist and craftsman. Abraham Crum Shortridge (1863-1919) was Superintendent of the Indianapolis Public School from 1863 until 1874, at which time he became President of Purdue University. After serving as Purdue’s President for only two years, Shortridge returned to his home on the northeast corner of Home Avenue (now 13th Street) and Broadway Street. He lived there from 1875 to until about 1894, selling his residence to a family named McFarland, several members of which were IPS schoolteachers. Shortridge then moved to acreage in Irvington. He served as justice of the peace and briefly taught school, but I have never seen any information indicating that he ran the Warren Township school system or that he built many new schools in Warren Township. Irvington was annexed to the City of Indianapolis in 1902, and although Shortridge resided in Warren Township, he did not reside in the outer portion of Warren Township that would have built township schools. Shortridge’s primary purpose in moving to Irvington was to farm, but between his being nearly blind most of his adult life and his having a leg amputated after an accident with an interurban car, Shortridge could not physically handle the work required to run a farm. He forced his wife Martha, whom he had married in 1899, to do all of the physical labor. 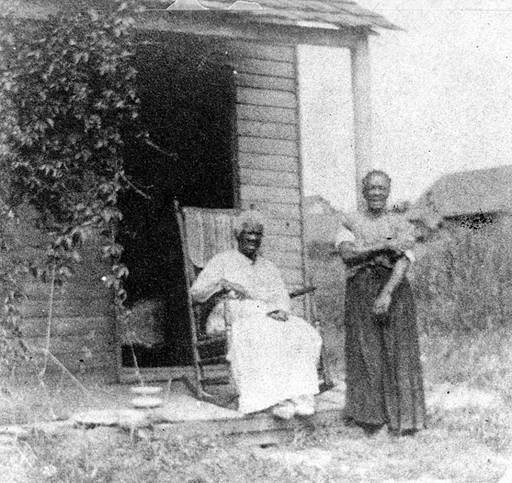 Martha left Abraham by 1905 and later divorced him, citing his cruelty in making her take on all of the chores of the farm. Abraham Shortridge spent the final decade (or more) of his life living with one of his sons on Lowell Avenue. If you know of any sources that confirm that Harry E. Wood was a principal at Indianapolis (later Shortridge) High School OR that Abraham Shortridge ran the Warren Township school system, I would very much appreciate knowing what those reference works are. I appreciate the clarified update on this information. Now I have the facts. Thanks. In 1953, after undergoing a $160,000 renovation, the school opened as Harry E. Wood Vocational School, honoring one of the nation’s leaders in the progress of manual training education, drawing students from nine neighborhood elementary school. On March 20, 1954, after receiving accreditation, the school became the eighth Indianapolis high school and was renamed Harry E. Wood High School, a six-year high school serving grades seven through twelve. Along with a full academic curriculum, Wood High School offered courses in auto body repair, barbering, beauty culture, cleaning and pressing, dental assistance (the only school in America to do so) practical nursing, shoe repair, commercial food preparation, printing, mechanical drawing/drafting, metal work along with transportation and power. To its credit, during its first three years of existence, Harry E. Wood High School lowered the Indianapolis drop-out rate by more than 15%. With the construction of I-70, which brought the destruction of hundreds of home through the center of Wood High School’s student population, citing declining enrollment, the school was the first ever high school closed in Indianapolis. 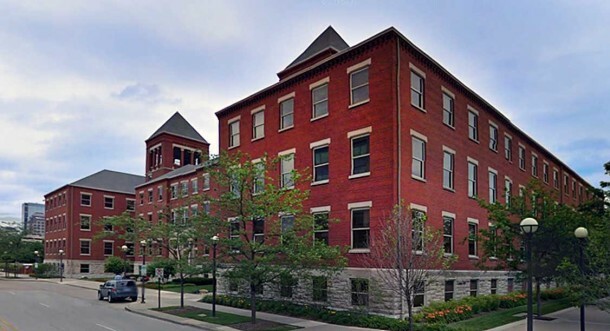 Since the school’s closure, the building has been converted into high end office space and has been owned by The Indianapolis, Christian Schools, Brougher Insurance and Eli Lilly. It now owned by American Realty Capital Trust and is being used as hi-scale office space. Thanks for the additional information, Don. Have you been involved with the building? Correction to the above posting: On March 20, 1954 (not 1965), after receiving accreditation, the school became the eighth Indianapolis high school and was renamed Harry E. Wood High School. There was a sidewalk from the school to another building across the street. And there was a sidewalk upstairs. Is it still there? I attended this high school in 1941 as a freshman, does anyone know if there are any pictures of this school from 1941?